Please note: My organization of this block drive is now complete. 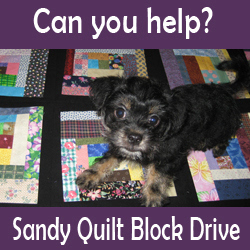 If you still wish to participate, check the equilter page to see if they are still accepting quilts. I know many of us are devastated by what we’ve seen in the news as a result of super storm Sandy. My heart goes out to all of those affected. I also know that many quilters are wondering what they can do to help. With that in mind, I’m organizing my first-ever Quilt Block Drive and I hope you’ll join in and help out too. Quilts from the block drive event will be donated to the equilter initiative. The need is desperate and if you have quilts already done, they would be most grateful to get them now. I’m looking for volunteers to make the blocks and team leaders to assemble the blocks, provide the backing and batting, quilt and bind the top, and then mail it directly to the distribution centre. We’ll be making 12″ quilt blocks using the Wonky Scrappy Log Cabin tutorial. 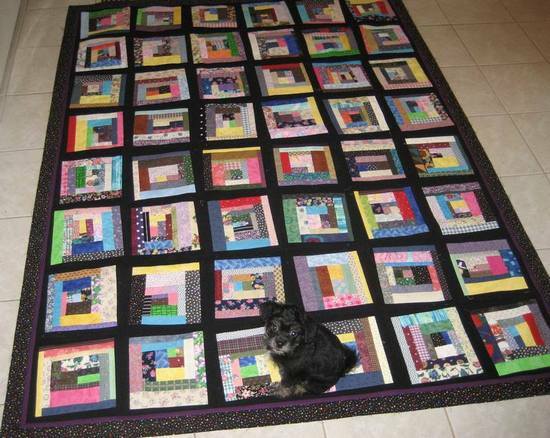 The finished quilts will be similar to the one below. The blocks will be sent to the team leader for assembly into the finalized quilts. This is a really easy and fun block to make, suitable for all levels. You’ll be making them over-sized and the team leaders will be trimming them to 12.5″ for assembly. I’m looking for block makers and team leaders. Those making blocks will also send a 5″ label that can be incorporated into the quilt backing. The finished quilts will contain 42 blocks (6 across, 7 down), with a finished size of 72″ x 84″. The team leaders can add additional borders if they wish. For those making blocks, you’ll indicate on the registration form how many blocks you’ll be sending (up to 20 at a time). Those assembling the quilts (i.e. team leaders), will indicate how many quilts they wish to do. I’ll then assign block makers to team leaders so that there are 42 blocks being made for each quilt. For those making the quilt blocks, once you’ve been assigned your team leader, you’ll have two weeks to mail your blocks. For those assembling the quilt tops, finish them as quickly as you can and send directly to equilter distribution centre. All quilts should be sent by end of March 2013. (Team Leaders: be sure to check the equilter page before you send in case the address changes). Block Makers – registration turned off, as I have no team leaders. Any questions, please first read the tutorial page and the info above. If not answered, email me. Other blocks and quilt tops: While I appreciate the offer of other blocks, for the quilt drive I’m organizing, we are using ONLY the scrappy log cabin blocks. Check the other initiatives at the bottom of this page that might be interested in receiving your blocks and/or unfinished quilt tops. Please share the logo below on your own blog. Need help? If you have a Blogger/Blogspot blog, see How to Add a Logo to Blogger/Blogspot for instructions. For WordPress.com sites, see this tutorial on text widgets. If you know of another initiative, please email me the page with info and I’ll add it to the list above.